"An important book that should embolden anyone who's ever been told, 'Speak up!'" 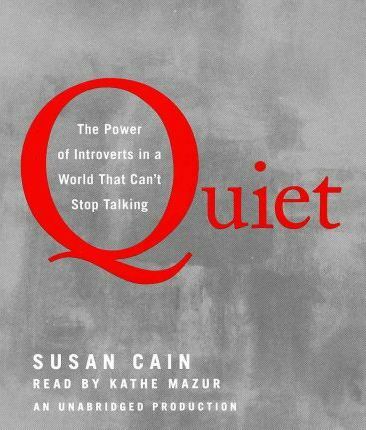 "Cain offers a wealth of useful advice for teachers and parents of introverts...Quiet should interest anyone who cares about how people think, work, and get along, or wonders why the guy in the next cubicle acts that way. It should be required reading for introverts (or their parents) who could use a boost to their self-esteem." --Wall Street Journal "An intriguing and potentially life-altering examination of the human psyche that is sure to benefit both introverts and extroverts alike." --Kirkus, Starred Review "Cain gives excellent portraits of a number of introverts and shatters misconceptions. Cain consistently holds the reader's interest by presenting individual profiles, looking at places dominated by extroverts (Harvard Business School) and introverts (a West Coast retreat center), and reporting on the latest studies. Her diligence, research, and passion for this important topic has richly paid off." --Publishers Weekly "This book is a pleasure to read and will make introverts and extroverts alike think twice about the best ways to be themselves and interact with differing personality types." --Library Journal "An intelligent and often surprising look at what makes us who we are." --Booklist "In this well-written, unusually thoughtful book, Cain encourages solitude seekers to see themselves anew: not as wallflowers but as powerful forces to be reckoned with." --Whole Living "Those who value a quiet, reflective life will feel a burden lifting from their shoulders as they read Susan Cain's eloquent and well documented paean to introversion--and will no longer feel guilty or inferior for having made the better choice!" --MIHALY CSIKSZENTMIHALYI, author of Flow and Distinguished Professor of Psychology and Management, Claremont Graduate University "Superbly researched, deeply insightful, and a fascinating read, Quiet is an indispensable resource for anyone who wants to understand the gifts of the introverted half of the population." --GRETCHEN RUBIN, author of The Happiness Project "Quiet is a book of liberation from old ideas about the value of introverts. Cain's intelligence, respect for research, and vibrant prose put Quiet in an elite class with the best books from Malcolm Gladwell, Daniel Pink, and other masters of psychological non-fiction." --TERESA AMABILE, Professor, Harvard Business School, and coauthor, The Progress Principle "As an introvert often called upon to behave like an extrovert, I found the information in this book revealing and helpful. Drawing on neuroscientific research and many case reports, Susan Cain explains the advantages and potentials of introversion and of being quiet in a noisy world." --ANDREW WEIL, author of Healthy Aging and Spontaneous Happiness "Susan Cain has done a superb job of sifting through decades of complex research on introversion, extroversion, and sensitivity--this book will be a boon for the many highly sensitive people who are also introverts." --ELAINE ARON, author of The Highly Sensitive Person "Quiet legitimizes and even celebrates the 'niche' that represents half the people in the world." --GUY KAWASAKI, author of Enchantment: The Art of Changing Hearts, Minds, and Actions "Susan Cain is the definer of a new and valuable paradigm. In this moving and original argument, she makes the case that we are losing immense reserves of talent and vision because of our culture's overvaluation of extroversion. A startling, important, and readable page-turner that will make quiet people see themselves in a whole new light." --NAOMI WOLF, author of The Beauty Myth "Superb...A compelling reflection on how the Extrovert Ideal shapes our lives and why this is deeply unsettling. Based on meticulous research, it will open up a new and different conversation on how the personal is political and how we need to empower the legions of people who are disposed to be quiet, reflective, and sensitive." --BRIAN R. LITTLE, PH.D., Distinguished Scholar, Department of Social and Developmental Psychology, Cambridge University "Quiet elevates the conversation about introverts in our outwardly-oriented society to new heights. I think that many introverts will discover that, even though they didn't know it, they have been waiting for this book all their lives." --ADAM S. MCHUGH, author of Introverts in the Church "Gentle is powerful... Solitude is socially productive... These important counter-intuitive ideas are among the many reasons to take Quiet to a quiet corner and absorb its brilliant, thought-provoking message." "Memo to all you glad-handing, back-slapping, brainstorming masters of the universe out there: Stop networking and talking for a minute and read this book. In Quiet, Susan Cain does an eloquent and powerful job of extolling the virtues of the listeners and the thinkers--the reflective introverts of the world who appreciate that hard problems demand careful thought and who understand that it's a good idea to know what you want to say before you open your mouth." "A smart, lively book about the value of silence and solitude that makes you want to shout from the rooftops. Quiet is an engaging and insightful look into the hearts and minds of those who change the world instead of tweeting about it." SUSAN CAIN is the co-founder of Quiet Revolution and the author of Quiet: The Power of Introverts in A World That Can't Stop Talking, which has been translated into 40 languages, has been on the New York Times bestseller list for more than five years, and was named the #1 best book of the year by Fast Company magazine, which also named Cain one of its Most Creative People in Business. Cain is also the author of the bestseller Quiet Power: The Secret Strengths of Introverts, and the co-founder of the Quiet Schools Network and the Quiet Leadership Institute. Her writing has appeared in the New York Times, The Atlantic, The Wall Street Journal, and many other publications. Her record-smashing TED talk has been viewed more than 14 million times and was named by Bill Gates one of his all-time favorite talks. Cain has also spoken at Microsoft, Google, the U.S. Treasury, the S.E.C., Harvard, Yale, West Point and the US Naval Academy. She received Harvard Law School's Celebration Award for Thought Leadership, the Toastmasters International Golden Gavel Award for Communication and Leadership, and was named one of the world's top 50 Leadership and Management Experts by Inc. Magazine. She is an honors graduate of Princeton and Harvard Law School. She lives in the Hudson River Valley with her husband and two sons. Visit Cain and the Quiet Revolution at www.quietrev.com.